Last week, the Tax Foundation made a trip to Chicago to speak at the Council on State Taxation (COST) and National Conference of State Legislatures (NCSL) Tax Academy Policy Seminar. The event was a great opportunity to meet with state legislators and tax policy professionals from around the country and take part in three days of informative and thought-provoking sessions on state tax policy. On the first day of the conference, I led a breakout session giving a primer on how state personal income taxes work and explained some national trends. Since the information is a good introduction to individual income taxation in the states, we're posting the content here. How much do states rely on personal income taxes, on average? Based on the most recent Census data available, personal income taxes (PIT) made up 36.5 percent of total U.S. state tax collections in the 2013 fiscal year. States vary around this average, however. Seven states don't have a PIT at all (Alaska, Florida, Nevada, South Dakota, Texas, Washington, and Wyoming). Among the states that levy income taxes, Oregon relies on personal income taxes the most (68.3 percent of total state tax collections in FY 2013), while Tennessee and New Hampshire rely on them the least (2.1 percent and 4.2 percent, respectively). The Tennessee and New Hampshire shares are so low because these two states don't tax wage and salary income like all other states with an income tax–they only tax interest and dividend income, meaning their individual income tax bases are much smaller. Among the states with a broader-based income tax, North Dakota relies on individual income tax the least, at 12.1 percent of total state tax collections. How are state income taxes structured? State income tax structures vary widely. Ten states have a single-rate, flat income tax (this includes Tennessee and New Hampshire's investment income taxes), while 33 states have graduated-rate income taxes (also referred to a progressive income taxes). Check out the GIF below to see state-by-state trends (click to enlarge). But within the graduated-rate group there is significant variation. For example, some states have two tax brackets (Kansas and Maine), while others have 10 or more brackets (California, Hawaii, and Missouri). The other progressive income tax states range between these two extremes. Some top brackets kick in at a very low level. Alabama, for example, has a top rate of 5 percent that kicks in at just over $3,000. New York, on the other hand, has a top rate that kicks in at over $1 million (as does California). To see rates and brackets for all 50 states and Washington, DC, click here. Since it's hard to summarize all of the important facts about state income taxes in just 20 minutes (the amount of time I had to speak), I decided to quickly outline 5 things we get asked about a lot during our work and travel throughout the states. (1) What are marriage penalties and marriage bonuses? Why do they matter? A marriage penalty occurs when a married couple pays more in income tax filing as a joint unit than they would if they were single and filed separately as individuals. The opposite, a marriage bonus, occurs when a married couple saves money by filing jointly than they would if they were single and filed separately as individuals (see GIF below; click to enlarge). Marriage penalties occur when married-filing-jointly brackets aren't doubles of the single brackets. When marriage penalties exist, they're a real example of non-neutrality in the tax code. While it seems like a silly example, the tax code shouldn't be one of the reasons a couple gets married–we want to minimize the decisions people make as a result of the tax code. (2) What's inflation indexing? Why is it important? A lack of inflation adjustment can also push more of a taxpayer’s income into the highest bracket for which they qualify. This combined with bracket creep can lead to a higher average tax rate. This is problematic because increased incomes haven’t risen in real terms—only nominally. Indexing addresses this by altering each bracket level each year by the level of annual inflation. Take an individual who earns $40,000. …[T]hat person takes a standard deduction of $6,100 and a personal exemption of $3,900, leaving $30,000 as taxable income. After applying [Maine's] tax table, he would owe $1,744 in state income tax. If the taxpayer then gets a 2 percent raise to keep up with inflation, his income rises to $40,800. Under [an inflation-adjusted income tax], the tax brackets also adjust with inflation and his state income tax bill will rise only to $1,779 (a 2 percent increase). But [if inflation adjusting is suspended], the tax brackets do not adjust for inflation, so the taxpayer’s state income tax would rise to $1,808 (a 3.6 percent increase). Lack of inflation indexing is a problem because it means tax bills rise, even if purchasing power doesn't. (3) What's typically in the state income tax base? Most states follow federal definitions of income quite closely (see Table 2 of this paper for a brief state-by-state analysis of state coupling to the federal code). The biggest piece of the tax base in most states is wage and salary income, but the base also includes things like pass-through business income (which we'll dive into in a bit more depth shortly), interest and dividend income, and capital gains income. Shares will vary from state to state. Some states may also tax certain pension and retirement income. The majority of income was from wages and salaries (68 percent), but there are still several other types of income. The same is true for the states. The only exception is New Hampshire and Tennessee, which only tax interest and dividend income. 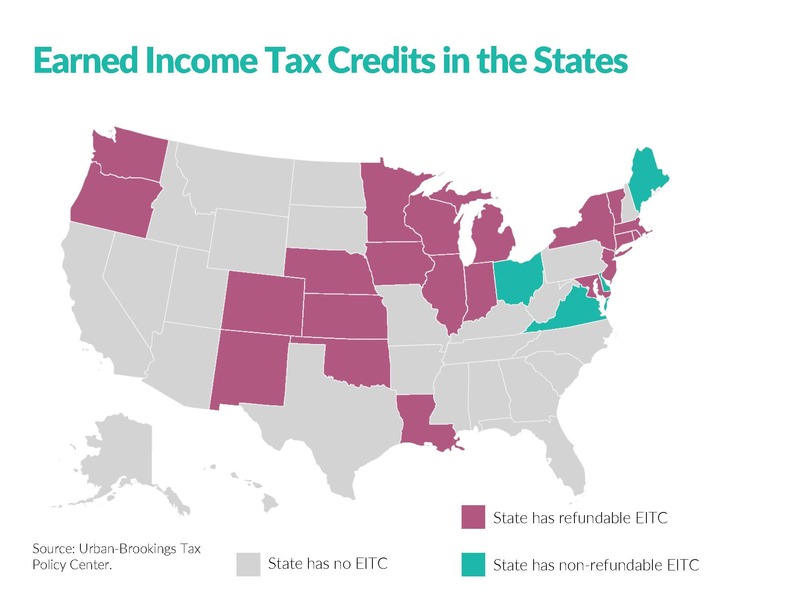 (4) What is an Earned Income Tax Credit, and which states have them? The Earned Income Tax Credit [EITC] is a refundable tax credit targeted at low-income, working individuals and families. The value of the credit varies by income and the number of children the taxpayer has. State credits are typically structured as a percentage of the federal EITC (see here for current federal income limits and credit amounts), and the amount granted varies from state to state. As of May 2015, 25 states plus DC have an EITC. Of those, 20 are refundable (meaning the credit can exceed income tax liability), four are not, and one is partially refundable (Rhode Island). For a listing of each state's percentages, see this table from the Urban-Brookings Tax Policy Center. The map below shows states with and without an EITC (click to enlarge). 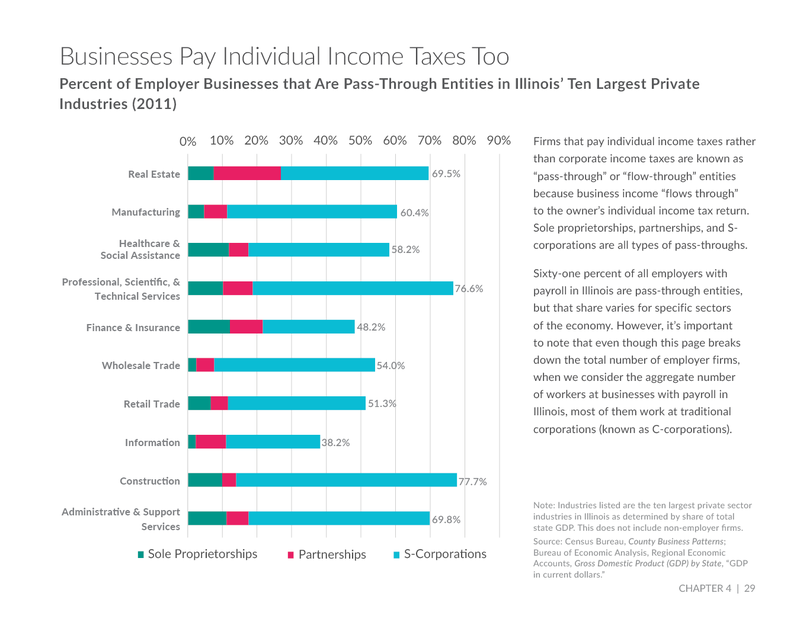 (5) Do personal income taxes impact business? Yes! Individual income taxes matter to a type of business called a "pass-through" entity (also known as a "flow-through"). A pass-through is a business entity in which profits are "passed through" the business and taxed on the owners' individual income tax return. Different pass-through business forms include sole proprietorships, partnerships, limited liability companies (LLCs), and S corporations (these are known as "legal forms of organization"). Kyle Pomerleau recently wrote a primer on pass-through tax issues (read it here). He included some great data on pass-throughs in the U.S., which showed these types of firms make up the majority of businesses (in addition to charts on pass-through employment and income, as well). County Business Patterns has data on pass-through employer businesses (firms with payroll). Each state's employer firms are broken down by legal form of organization, industry, number of establishments, number of employees, employment, and payroll. Nonemployer Statistics has data on pass-throughs that don't employ anyone–that is, the self-employed. This is broken down into legal form of organization, industry, number of establishments, and receipts. 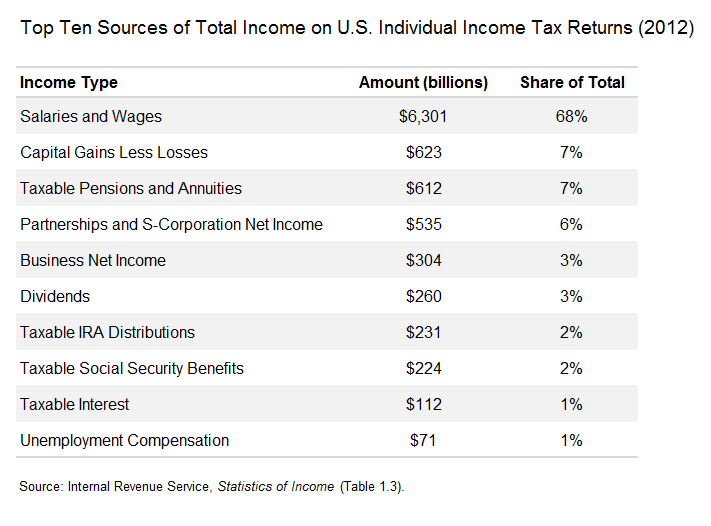 More on individual income taxes here. Follow Liz on Twitter @elizabeth_malm.